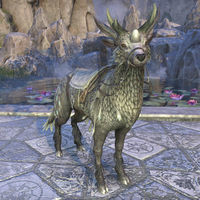 Nascent Indriks are special mounts that can be summoned by combining four magical feathers bought from The Impresario, as illustrated in Scroll, Indrik Life Cycle. Once summoned, the Nascent Indrik can be further evolved into one of four variants by feeding it certain berries. In order to acquire the base Nascent Indrik mount, players must take part in four in-game events and buy four magical feathers, with a different one available for each specific event in 2018. Feathers are bought with Event Tickets. The Nascent Indrik's default name is "Quiescence". As detailed in Memorandum: Indrik Emergence & Formal Development, Indrik can evolve when fed enchanted berries. There are four possible evolutions of the base indrik. Their evolutions correspond with the original feathers used to summon the base mount. Berries can be obtained in various events throughout 2019. These magical creatures have a special relationship to Y'ffre the nature god, and seem to draw strength from the very bones of the earth beneath their hooves. It's a privilege for a mortal rider to be borne by such an enchanted beast. 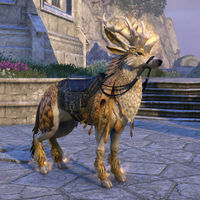 The Dawnwood Indrik is obtained by combining four different Dawnwood Berries with a Nascent Indrik mount. The Nascent Indrik will become the Dawnwood Indrik. "One of four Legendary Dawnwood Berries. Feeding all 4 to a Nascent Indrik will force it to evolve into a Dawnwood Indrik, thus removing the Nascent Indrik." 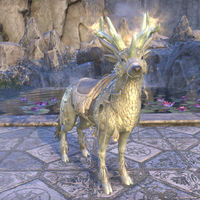 After the conclusion of the Jester's Festival, players are no longer be able to acquire the Dawnwood Indrik. The Luminous Indrik seems to radiate the same soft aetherial glow as the stars in the heavens, but steady and nearby rather than flickering and remote. It's reassuring, somehow. The Luminous Indrik is obtained by combining four different Luminous Berries with a Nascent Indrik mount. The Nascent Indrik will become the Luminous Indrik. "One of four Legendary Luminous Berries. Feeding all 4 to a Nascent Indrik will force it to evolve into a Luminous Indrik, thus removing the Nascent Indrik." 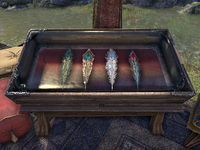 These berries will become available on their respective weeks, but will be available throughout the 5-week period of ESO's 5th Anniversary Event. 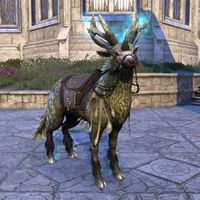 This event is the only chance players will have to acquire the Luminous Indrik mount. It's believed by some of the Sapiarchs of the High Elves that an Onyx Indrik comes about when a Nascent Indrik is exposed to certain berries imbued with geological Earthbones essences." 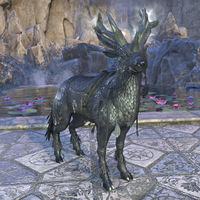 The Onyx Indrik is obtained by combining four different Onyx Berries with a Nascent Indrik mount. The Nascent Indrik will become the Onyx Indrik. The Pure-Snow Indrik is obtained by combining four different Pure-Snow Berries with a Nascent Indrik mount. The Nascent Indrik will become the Pure-Snow Indrik. Nascent Indriks are also located at the Event Exchanges located outside the main city in Auridon, Glenumbra and Stonefalls. They are found in pens next to the The Impresario alongside Dawnwood Indriks. This page was last modified on 2 April 2019, at 18:26.